Whether you are children or young adults, flash games are always fun and exciting. You can have access to these games thanks to Flash Game Downloader. It is designed for downloading flash games. Easy to use: downloading a flash game on your hard drive can be done trouble-free. First, you have to launch the application. Then, open the flash game in question to get the URL. You still have to copy/paste the address into the interface and specify the location of the file. Unlimited games: Flash Game Downloader offers you not only to download flash games but also to play them at any time. And thanks to "SWF Catcher", you are given the ability to download unlimited numbers of online games. Interface: you do not need to be a computer professional to download the games. In fact, this software has a clear and easy-to-use interface. Tools to be used are easily accessible as well as a help tab for more information. Operating Systems: Win XP, Win Vista, Win 7. 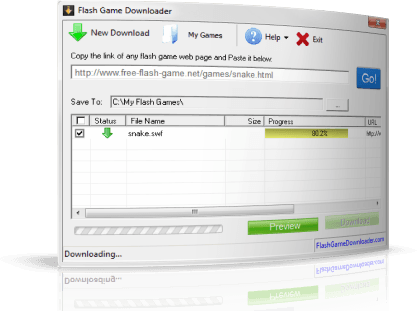 Flash Game Downloader can be downloaded for free. It's lightweight and doesn't use up too much space on the HDD. Latest update on November 20, 2016 at 02:56 PM.